The regattas or boat races of San Sebastian take place on the first two Sundays of September in La Concha Bay. The Thursday before the first Sunday, up to 24 crafts from the Cantabrian coast compete to obtain one of the seven positions of one of the most prestigious rowing competition of the season. These crafts have a thirteen-man crew: twelve oarsmen and a cox. They are an adaptation of the traditional fishing craft for sporting purposes. Since 2008 women's regattas are celebrated. The organisational scheme is similar to the male modality. A positive evolution in this sporting discipline has been found in our environment. The Euskal Jaiak (Basque Festivities) take place in September. 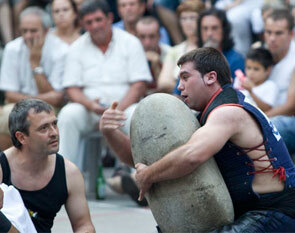 During these days, demonstrations and competitions of traditional Basque sports are held. A series of activities that go back to the olden days and are mostly connected to the daily labours of working the land and producing food in hamlets. The best-known sport is pilota (ball), which is played in courts in singles and pairs. 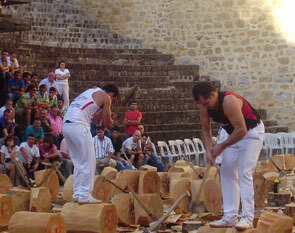 Other two Basque sports worth mentioning are the aizkolaris (log cutters) and harrijasotzailes (stone lifters).